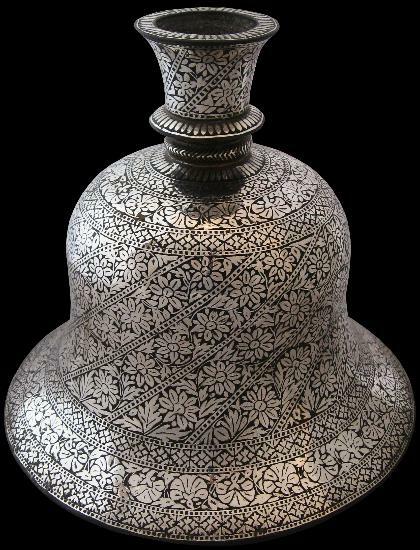 This bell-shaped hookah base is profusely decorated with inlaid silver. Unusually for a piece of this age, very little of the silver inlay has been lost. The inlay comprises a band of Ottoman-style stylised tulip heads around the base and shoulder, and spiralling bands of flowers on the body and neck. The base flares at the bottom far more than most extant examples giving it a particularly graceful and elegant shape. 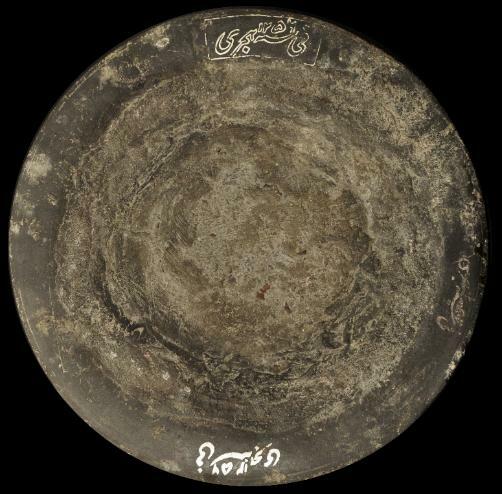 nasta’liq script and a date of 1256 which corresponds either to 1840 in the hijra calendar or to approximately 1811 if the Bangla calendar introduced by the Mughals was used. hijra date of 1296 (1878-9). Stronge, S., Bidri Ware: Inlaid Metalwork from India, Victoria & Albert Museum, 1985; and Lal, K., Bidri Ware: National Museum Collection, National Museum New Delhi, 1990.